A favourite amongst world top surfers. 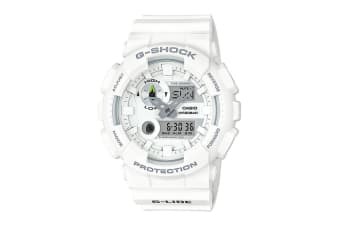 The G-Shock G-LIDE series is a long time favourite among world’s top surfers and street sports athletes. 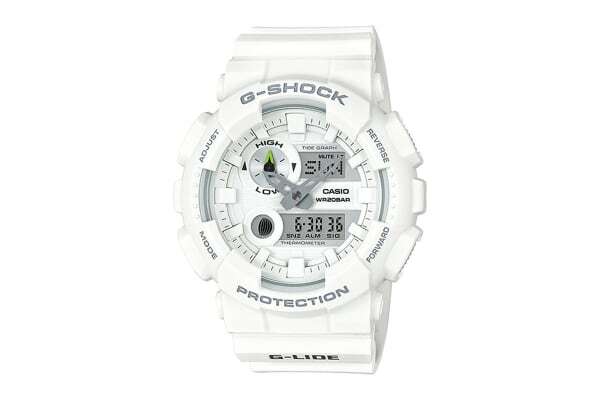 The Casio G-SHOCK G-LIDE GAX-100 combination model provides the best of both analog and digital formats. Large hour markers, hour hand, and minute hand contribute to easy reading. The arrow shaped minute hand and the contrasting color of the analog hands provide at-a-glance readings even while paddling or waiting the next wave. Surfing-oriented functions include Tide Graph, Moon Data, and temperature measurement. Just about everything about this watch is designed to support activities on the summer seas. An analog Tide Graph feature provides an intuitive readout of current time conditions when you need it. Comes with a beautiful half-matte finish. The standard monotone designs as well as the summer-like coloring of these G-LIDE models are sure to appeal to both surfers and street fashion lovers the world over.